Download the free Pencil United app here! SWEDEN – MAY 4, 2016 – Atmospheric, enigmatic and magical, Pencil United’s digital native graphic drama series Northern Souls follows the quest of a young man, suspected of having schizophrenia, to find his identity in Europe’s last wilderness, Swedish Lappland, at the same time as WW2 reaches northern Scandinavia. The first episode of the interactive touchscreen reading experience is now available for download, exclusively through the Pencil United app which can be retrieved from the App Store for all Retina iPads. The series’ main character Mielat, as the strange voices inside his head call him, is contained and tormented by the fact that he doesn’t remember who he is or where he comes from. Everything before the point where he found a peculiar piece of bone with metal pendants is black. With the twisted logic of the mentally ill, he believes that the artefact will lead him to the answers while the voices keep insisting that he has a hidden calling. As a result of a life-threatening flight, Mielat is reluctantly joined by a female German Red Cross doctor. Gradually it is revealed that the rational and determined woman, named Elke, has an agenda of her own but also that the two wanderers’ destinies are mysteriously entwined. 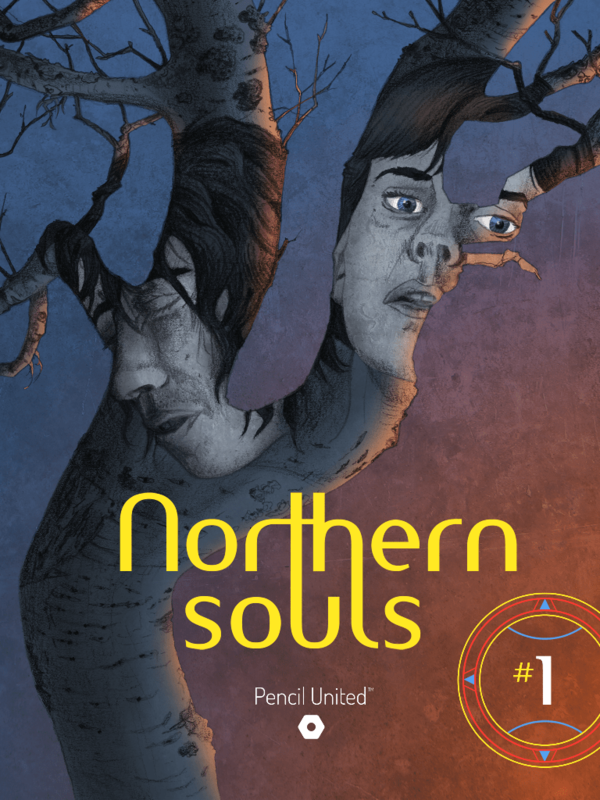 Northern Souls is aimed at a broad adult readership and is full of complex and charismatic characters. In addition to the adventure’s dramatic action the story also holds existential, ethical and political dilemmas. The time period during which the drama is set, right at the beginning of the 1940s, is not just the starting point for the progressive welfare state in Sweden but also the start of the atomic age and the series deals with themes such as the soul and materialism. “We want to use the strengths of comics in combination with the possibilities of the digital environment for exploring interesting story ideas, deeper themes and spreading knowledge,” Andy Mehlq, the creator behind Pencil United, explains and stresses their goal that all of their productions will have such unique qualities in all aspects. “We see ourselves as an HBO of original digital native comics in the sense that we have a sharp focus on creating a few carefully chosen in-house produced high quality drama series in different genres and give them relevant and enhancing digital reading interfaces,” Andy Mehlq says. When comics started to appear on tablets six years ago, thanks to Apple’s iPad, both readers and critics agreed that the digital environment could add something beyond the limitations of the printed page. But today the majority of digitally published comics are still repurposed print. So Pencil United has decided to cultivate and enhance interactivity and closeness by adding touch-the-panels navigation, dynamic dual-layer full screen graphics, slideshows, panning widescreen images and info hotspots, in order to create an intimate digital native experience unlike anything else on the market. As a part of Pencil United’s belief in the power of stories and the importance of education, creativity and humanism for development in the world, the studio has decided that for each and every downloaded issue through the Pencil United app they will buy five pencils from UNICEF who will distribute them to schools all over the world. ”We want to help children to learn to write, read, draw and support them to reach their full potential. And for us pencils are the ultimate symbol and tool for creativity and humanism”, Andy Mehlq at Pencil United says. ABOUT PENCIL UNITED: Pencil United is a Swedish independent digital comics studio that publishes original digital native in-house created graphic stories for touchscreen devices. The studio’s drama series are exclusively available in the studio’s branded app that can be retrieved from the App Store for all Retina iPads. Pencil United supports children’s learning and creativity by buying five UNICEF pencils for each and every issue that is downloaded through the app.